Copyright Urban Strategies Council 2008. All rights reserved. 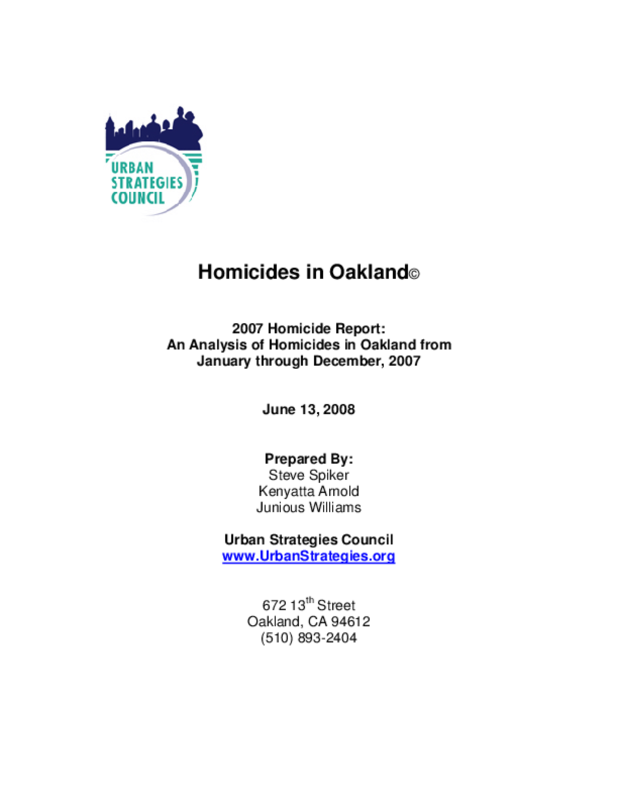 In past years Urban Strategies Council has produced quarterly or biannual reports on homicides in Oakland using detailed data provided by the Oakland Police Department's Homicide Section. Due to staffing shortages, the Oakland police Department is no longer able to provide this detailed data to the Council. As a result the 2007 Homicide Report uses data gleaned from public sources and some aggregated tables from the OPD's official report. From these data we have created this report on the characteristics of the 127 homicides that occurred in Oakland from January 1 through December 31, 2007. This report presents annual data from 2007 and shows how characteristics of homicides in Oakland changed from 2006 to 2007 and how 2007 homicides compare with the five -- year averages from 2003-2007. This report summarizes available information such as victim demographic characteristics (suspect details are less complete and less precise), locations and times of the incidents. Comparing 2007 data to a five-year average of homicides helps to provide a context for understanding whether there are emerging patterns that differ substantially from the patterns in prior years. This year sees the inclusion of some additional types of data relating to the nature of the homicides taking place in Oakland such as premises and types of weapons involved. Foundation Center thanks The James Irvine Foundation for its generous support of this project.